I love a light salad for summer nights. And we're definitely moving into summer. Where has the time gone? 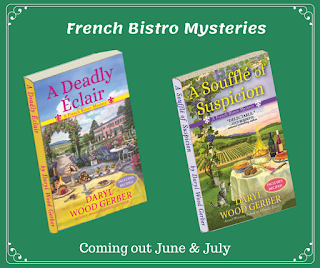 I know where mine has gone - writing a new Cookbook Nook mystery (turning it in in 2 weeks) and doing PR for my upcoming French Bistro Mystery releases. 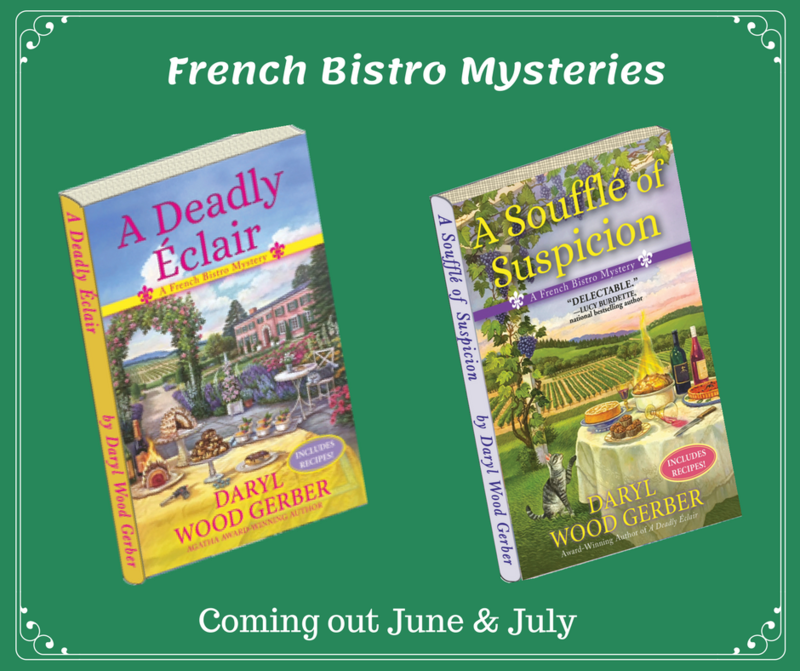 Yes "s" - 2 - as in A Deadly Éclair and A Soufflé of Suspicion, the first two books in the series. The first came out in hardcover last November, but it comes out again in trade paperback on June 12. The second comes out July 10. I'm doing a couple of cozy book tours for each. I hope you'll join me on the adventure. I'll also be doing release parties and such. My Facebook author page will tell you just about everything you want to know about where and when. FYI, the e-book version of A Deadly Éclair is on sale until the paperback release for $1.99 (and $1.20 on Amazon!) I'm not sure how I make money, but I hope you'll take advantage of the offer. In the meantime, back to light salads. I adore papaya. I adore avocado. I think they pair perfectly. Maybe it's because they are "sort of the same" on the inside. Seed(s) in the center. Scoopable flesh from their ovoid shell. And both have a delicate, smooth texture. Yum! I also love the vitamins provided by both. 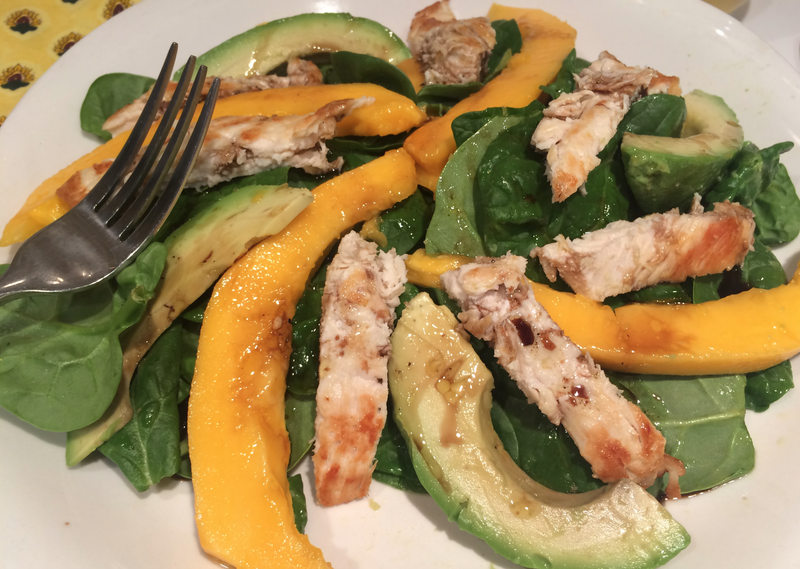 Avocado: One-third of a medium avocado has 80 calories and contributes nearly 20 vitamins and minerals, making it a great nutrient dense food choice. Papaya: is rich in fiber, Vitamin C, and antioxidants, which prevent cholesterol build-up in your arteries. If knowing a salad is good for you don’t “rock your boat,” then how about appreciating the color? If you’re not an aficionado of these fruits, at least try the dressing. It’s to die for. Enjoy. Pound the chicken on a cutting board. In a large sauté pan, heat the 1-2 tablespoons of olive oil. When it’s really hot, add the chicken breast. Quick fry for 1-2 minutes. You might want to put a lid or “splatter guard” over it. (*Love mine) Flip the chicken and cook another 2-4 minutes until you know it’s cooked through. Set on a plate lined with a paper towel. Meanwhile, get ready to construct the rest of the salad and dressing. Slice the papaya and avocado. On two plates, mound fresh spinach. Slice chicken. Alternate papaya, avocado, and chicken on top of the spinach. Make the dressing. In a measuring cup, mix all the ingredients and whisk until incorporated. Drizzle over the salads.